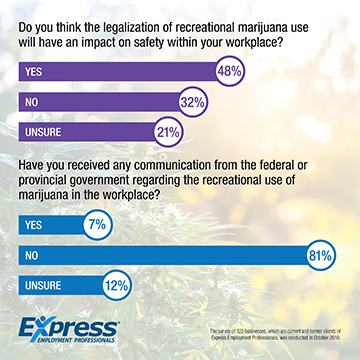 Two-Thirds of Canadian Businesses Polled Are Concerned with Recreational Marijuana Use in the Workplace. With only one week until recreational marijuana use becomes legal, more than 80% of businesses polled have not received any information from federal or provincial governments regarding marijuana use in the workplace. The survey of 322 small- and medium-sized businesses, which are current and former clients of Express Employment Professionals, was conducted in the first week of October 2018 to gauge respondents’ views on the legalization of the recreational use of marijuana and its impact on the workplace. Full results are below.